DURING the week, in the course of my wanderings, I found myself at the Wild West Show. It is most charmingly picturesque. With the lofty wigwams and their curious totems, the silent crimson-blanketed figures of the Indians, Red Shirt's inscrutable Napoleonic face, and the dash and vivacious "go" of the cowboys—it seemed to a staid Londoner like myself impossible to realise that one was still in this humdrum city. I had a chat with the Hon. 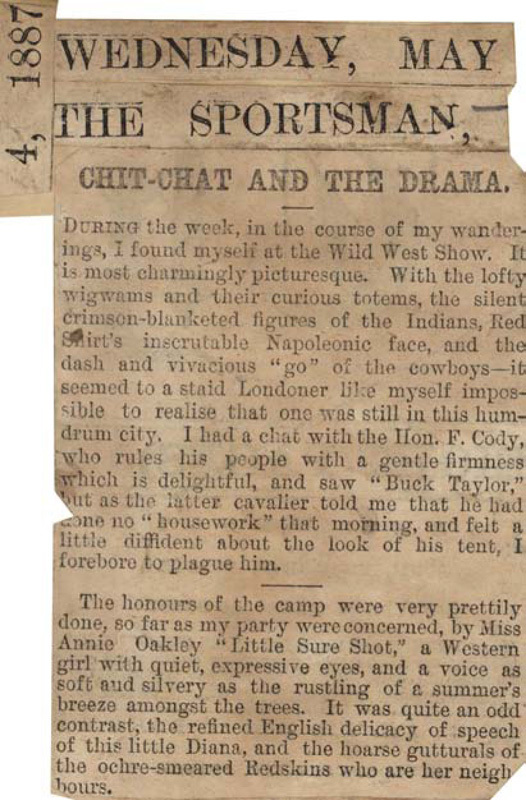 F. Cody, who rules his people with a gentle firmness which is delightful, and saw "Buck Taylor," but as the latter cavalier told me that he had done no "housework" that morning, and felt a little diffident about the look of his tent, I forebore to plague him. 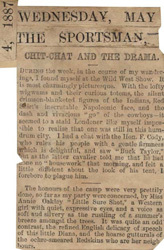 The honours of the camp were very prettily done, so far as my party were concerned, by Miss Annie Oakley "Little Sure Shot," a Western girl with quiet, expressive eyes, and a voice as soft and silvery as the rustling of a summer's breeze amongst the trees. It was quite an odd contrast, the refined English delicacy of speech of this little Diana, and the hoarse gutturals of the ochre-smeared Redskins who are her neighbours.